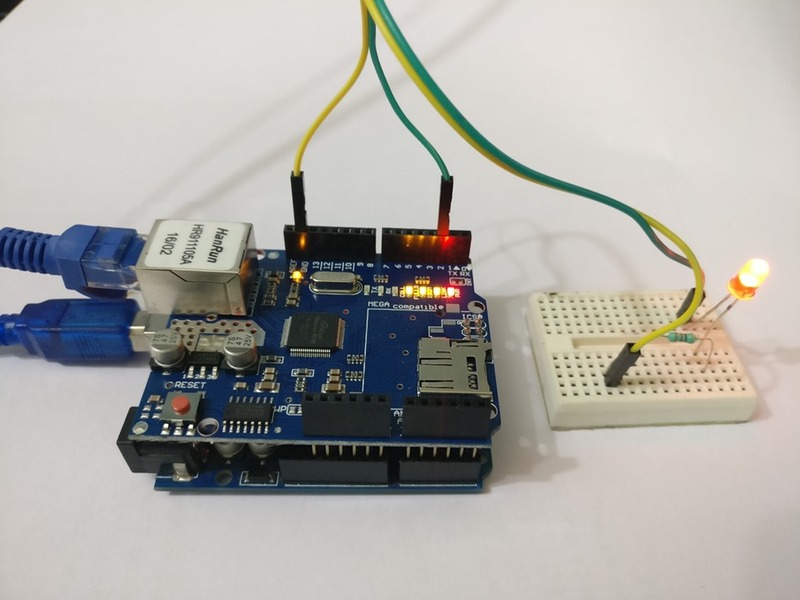 The Arduino talks to Ethernet shield over SPI Serial Peripheral Interface. So to work with the shield you need to include both the Ethernet & SPI libraries in the top of the sketch. The next piece of information is the MAC address of the shield , usually expressed as 6 bytes. If your Shield has the address printed , use that MAC address.Otherwise you can settle for a random 6 bytes , as it is unlikely that another device of same address exists in the same network. The MAC address is typically included in the Arduino sketch as global array of bytes. 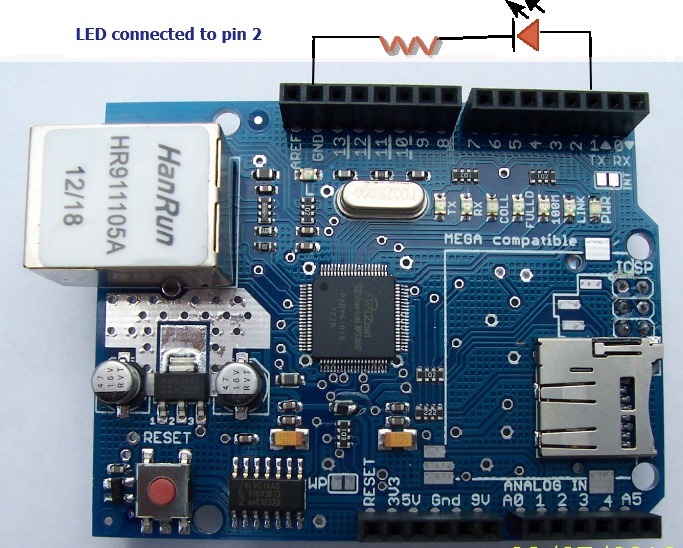 PIN 2 is assigned to LED & a string variable readString is assigned to store the request. The method begin() in the Ethernet class attempts to connect to the Network using the details passed into its arguments. 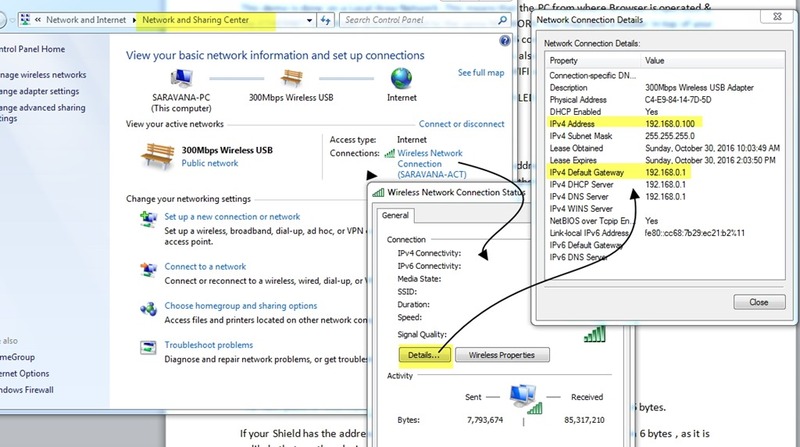 Here we pass an IP address & the Ethernet shield makes a Network connection using a STATIC IP address. 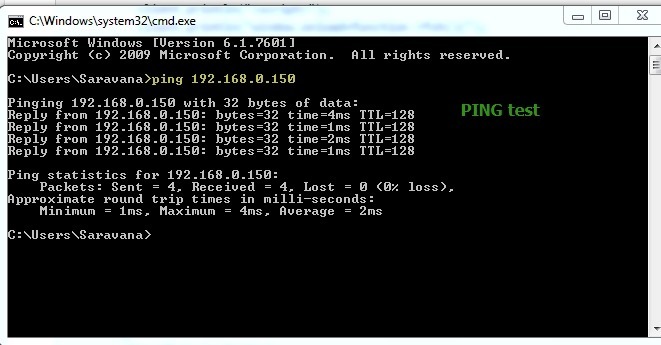 Ping the IP address of the Shield. If you get back result , then you’re ready to connect the client. When you surf to the IP address of the Arduino server, the web browser (client) will send a request, such as the one shown below, to the server. The information in the request will differ, depending on the browser and operating system that the request is sent from. The \r\n characters that you see at the end of every line of text in the request are non-visible characters (non-printable characters). \r is the carriage return character and \n is the linefeed character (or newline character). The last line of the request is simply \r\n without and preceding text. This is the blank line that the Arduino sketch checks for before sending a response to the client web browser. In other words, the sketch reads every character from the above request and knows when the end of the request has been reached because it finds the blank line. After receiving the request for a web page from the client, the server first sends a standard HTTP response and then the web page itself. Again the non-visible characters \r\n are shown in the above response. The println() function in the the sketch automatically adds the \r\n characters to the end of each line. The empty println() function at the end of the HTTP response simply sends the \r\n with no text in front of it. After the server has sent the HTTP response, it sends the actual web page which is then displayed in the browser. The web page consists of text with HTML tags. You do not see the tags in the browser as these tags are interpreted by the browser. The actual HTML markup tags are shown below. Now the browser displays the WEB PAGE sent as response from the Server. indexOf String function is used to search for the string LEDON or LEDOFF. The indexOf function returns a –1 if it doesn’t find the wanted string.This function is used to make the LED ON or OFF accordingly. It works nicely pal. And I tested that over a building’s local network and also over WiFi. your guide is really great and it is useful but i have some problems with usuing a servo could you please help? It is working over the whole wi-fi. Your article is simple, just for the non – specialists. Are you a teacher ?? Please, keep on this nice try. Thank you kindly sir ! !